5 benefits loaded into 1 toilet block. From the UK?s No.1 Toilet Brand. Rim block cleans, freshens and leaves your toilet bowl shiny. Ocean-scented Toilet Rim Block. A perfect combination with toilet bleach for a fresh germ-free toilet. Pairs well with Domestos Bleach. Try the UK's No.1 Toilet Block: Domestos Power 5. It will leave your toilet clean, shiny, and smelling fresh. Power 5 Toilet Blocks are more than a toilet freshener. These powerful rim blocks are loaded with not 1, but 5 key benefits for a mighty clean and to provide extra freshness. 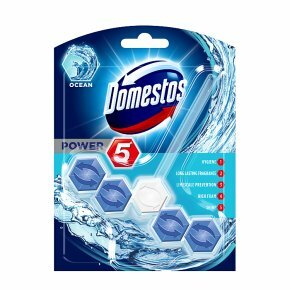 Domestos Power 5 Ocean Toilet Rim Block gives your bathroom a fresh ocean scent and long-lasting protection against bacteria and germs. Flush after flush, Power 5 Rim Block releases a rich foam, prevents limescale, removes dirt, and leaves the toilet bowl shiny, all while releasing a fresh and long-lasting fragrance in your bathroom. Maintaining the freshness and cleanliness of your toilet has never been easier thanks to Domestos Power 5 Rim Blocks. And for complete toilet hygiene, try our toilet cleaner Domestos Bleach for long-lasting protection against germs. Domestos Toilet Bleach and Domestos Rim Block are the perfect combination for a fresh germ-free toilet! A 1pc of Domestos Power 5 Ocean Toilet Rim Block is enough to kill germs in your toilet bowl and keep it looking shiny. How to use: Unfold hanger, break plastic hook, and hang over the toilet where the flow of water is strongest. After the product has been removed from its pack, please dispose of any excess material remaining in the pack. Wash hands thoroughly after handling. Domestos have been protecting families against germs since 1929. Today, Domestos continues to protect millions of families with its full range of cleaning products, including thick bleach and bleach sprays, which can be used as a multi-purpose cleaner all around your home, as a bathroom cleaner, or even as a drain cleaner. Toilet wipes, toilet rim block, and sink and pipe unblocker products are also available to keep your home hygienic. Domestos doesn't just protect families at home though ? they fight poor sanitation globally too. They've helped more than 10 million people gain access to a clean and safe toilet, and thousands of children have benefited from clean water and toilet facilities in their schools, helping improve attendance and educational achievement. Support their work and help to empower millions of families to have clean and safe toilets. Visit Domestos.co.uk to find out more.